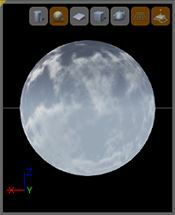 The Material Editor UI consists of a menu bar, a toolbar, and, by default, four open panels. Menu Bar - Lists the menu options for the current Material. Toolbar - Contains tools that you can use to work with your Material. Viewport Panel - Previews the Material on a mesh. Details Panel - Lists the properties of the Material or the selected material expression or function nodes. 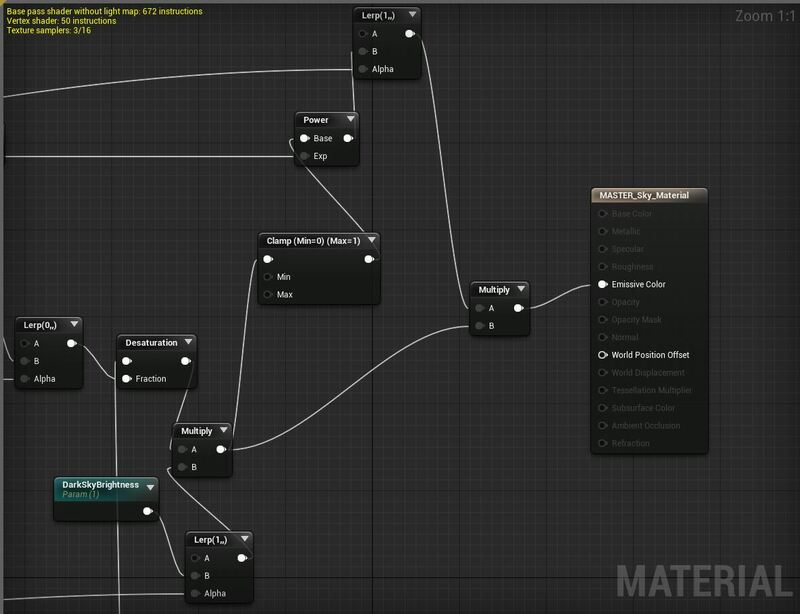 Graph Panel - Displays the material expression and function nodes that create shader instructions for your Material. Palette Panel - Lists all the available material expression and function nodes. There is also an HLSL Code panel, but by default, it is not visible. To display it, on the Window menu, click HLSL Code. For more information, see HLSL Code . Graph - Toggles the display of the Graph panel. Palette - Toggles the display of the Palette panel. Stats - Toggles the display of the Stats panel. HLSL Code - Toggles the display of the HLSL Code panel (which is closed by default). The following table lists the options in the Toolbar and what they do. Applies any changes made in the Material Editor to the original Material and any uses of that Material in the world. Finds expressions and comments in the current Material. Centers the base Material node in the Graph panel. 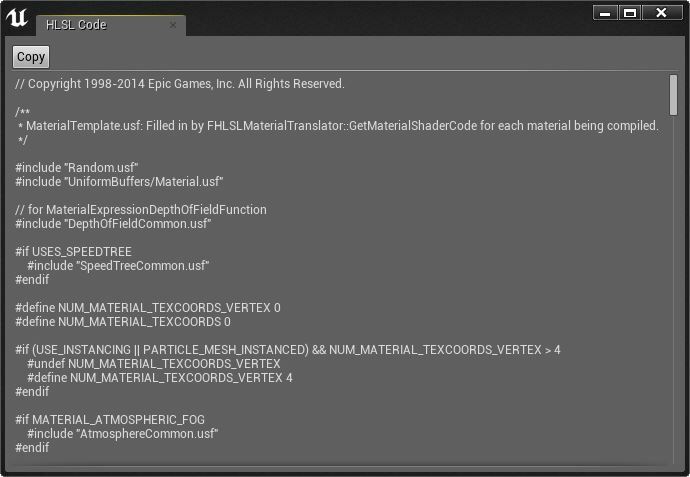 Deletes any material nodes that are not connected to the Material. Shows or hides material nodes that are not connected to anything. If enabled, updates the Materials in each material node in real time. Disable this option for faster Material Editor performance. See the Live Nodes and Live Update section. If enabled, compiles the shaders of all subexpressions every time nodes are added, deleted, connected, or disconnected, or have their property values changed. 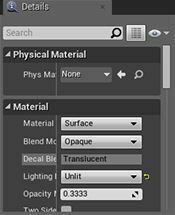 Disable this option for faster Material Editor performance. See the Live Nodes and Live Update section. Shows or hides Material statistics in the Graph panel. Toggles use of release or development shaders in stats reporting. Toggles displaying of stats for an empty Material. Helps identify cost of changes in the graph. Toggles Material stats and compilation errors for mobile. The Viewport panel displays the Material being edited applied to a mesh. You can navigate in the Viewport panel by using the options in the following table. The viewport mesh can be changed by using the associated toolbar controls (the shape buttons, Select Preview Mesh combo, and Use Selected StaticMesh button). The viewport mesh is saved with the Material so that the next time the Material is opened in a Material Editor, it will be previewed on the same mesh. Several icons appear along the top of the Preview panel; the following table details their usage. Shows the result of your current Material on the respective primitive shape in the Preview panel. Makes the selected Static Mesh in the Content Browser the preview mesh. Toggles the background grid in the Preview panel. If enabled, updates the Material on the preview mesh in real time. Disable this option for faster Material Editor performance. This panel contains a property window for all currently selected material expression and function nodes. If no nodes are selected, the properties of the Material being edited will be displayed. See 材质属性 for descriptions of all Material properties. This panel contains a graph of all material expressions that belong to this Material. The number of shader instructions used in the Material as well as any Compiler Errors are displayed in the upper left corner. The fewer the number of instructions, the less costly the Material. Material expression nodes that are not connected to the base material node do not contribute to the instruction count (cost) of the Material. By default, each Material contains a single base Material node. This node has a series of inputs, each associated with a different aspect of the Material, that other material nodes can connect to. See 材质输入 for descriptions of the various inputs of the base Material node. The Palette panel contains a list of material nodes that can be placed in a Material via "drag and drop". To place a new material node, drag it into the Graph panel. You can filter the material nodes listed in the Palette panel by choosing either Expressions or Functions in the Category drop-down list. For more information about material functions, see Material Functions . This panel shows the High Level Shader Language (HLSL) code that is generated by the current Material. Be aware that this is not an editor; you will not be able to change the HLSL code. Rather, this is merely a viewer to allow you to visualize the code defined by your material network. The Code View panel is not visible by default. To display it, on the Window menu, click HLSL Code. Controls in the Material Editor generally match the controls of other tools in the Unreal Editor. For example, the material expression graph can be navigated as with other linked object editors, the material preview mesh can be oriented as per other mesh tools, etc. Shift + LMB on connector Marks the connector. Performing the action again with a connector marked will create connection between the two connectors. This is a quick way of making connections over large distances.